Substance editor George N. Schmidt received the Kenneth S. Goodman “In Defense of Good Teaching” award on March 8, 2008, at the University of Arizona in Tuscon. March 8, 2008. 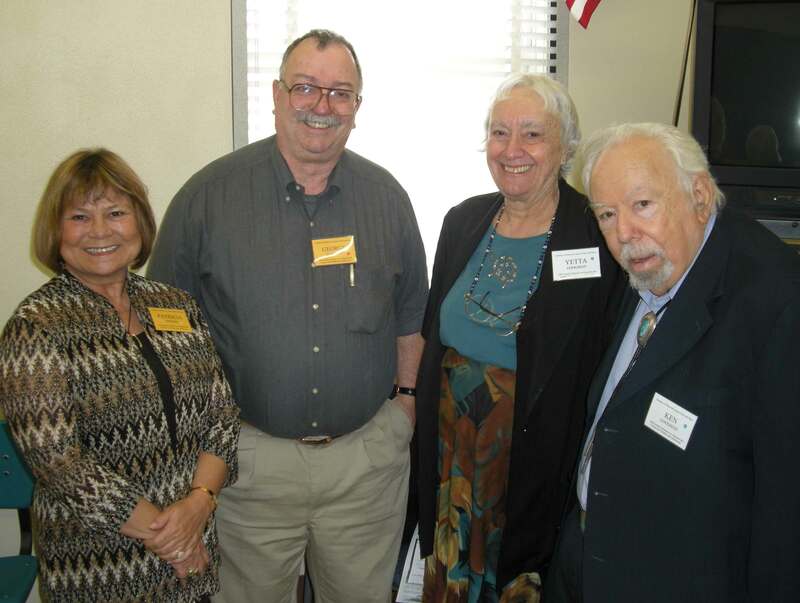 Above (left to right): Patty Anders, head of the department of Language, Reading and Culture at the University of Arizona College of Education, Substance editor George N. Schmidt, Emeritus Professor Yetta Goodman of the University of Arizona, and Emeritus Professor Kenneth Goodman of the Univesity of Arizona at the time of the presentation of the “Kenneth S. Goodman in Defense of Good Teaching Award” to Schmidt. Schmidt spoke at the university’s annual conference on children and young adult literature. Substance photo by Sharon Schmidt. The university’s Department of Language, Reading and Culture in the College of Education recognized Schmidt for his work in exposing the Chicago public schools’ flawed testing program. Schmidt published some of the Chicago Academic Standard Exams (CASE) in Substance when the controversial tests were in a pilot stage in January 1999. Due to the Schmidt’s exposure of the poor quality of the tests and his analysis of the faulty CASE program (which spurred additional public criticism and a boycott of the tests by several Curie High School English teachers), the Chicago public schools dropped the CASE and its plan for a system-wide standardized high school curriculum. Patty Anders, head of the Department of Language, Reading and Culture, presented the award to Schmidt at the department’s 16th Annual Conference on Literature and Literacy for Children and Adolescents. Anders said donations by university faculty paid for the award. Schmidt and this reporter were flown to Tucson, treated to a wonderful weekend that included hotel accommodations, meals, a party in a beautiful mountain home to celebrate the conference, and a tour of the Sabino Canyon. Anders noted in her introduction of Schmidt that recipients of the award were expected to work. Schmidt spoke at the conference, presenting information about CASE and Substance in one of the break-out sessions. Anders said that the Department of Language, Reading and Culture at the University of Arizona established the award in 2000 to honor Dr. Goodman upon his retirement from full-time teaching at the university. In addition to his work as a professor at the University of Arizona, Goodman is the author of many books and articles on reading, and a former president of the International Reading Association. He is recognized internationally for a lifetime of work as an advocate for teachers, political action, and holistic education. The Department of Language, Reading and Culture notes in an explanation of the award that nominees for the “In Defense of Good Teaching” award can be “professionals at any level who have stood up in an extraordinary way for well-grounded, humanistic, holistic education.” Many recipients of the award, like Schmidt, have fought against the misuse of standardized testing. Many, like Schmidt, suffered economic and other consequences as a result of their actions. Schmidt maintained then, as he continues to maintain now, that the only way the public can evaluate what he refers to as “so-called standardized tests” is by making the complete tests, along with all related materials, available to the public after the tests are administered. “In most states, the problem is that the media are fed what are called ‘sample questions’ and people play a kind of trivial pursuit with the sample questions. But one question or a couple of questions doesn’t tell you anything about the test itself. If anything, the sampling is designed to be misleading.” Schmidt note that under state law, Massachusetts, New York, and Texas have long published the complete testing information after tests are administered. Neither Illinois nor Chicago wanted the content of their testing programs revealed to the public, even after the tests were completed. So Schmidt published the entire CASE tests in six subject areas, and Substance readers were astonished by the poor quality of the tests, and in many cases the ridiculous questions that high school students were being forced to answer. In what Schmidt now refers to as a “Shock Doctrine” attack in the courts and in most of the mass media, he and Substance were forced into an expensive legal fight defending against a million dollar legal assault. The legal fight only ended in 2004 with the refusal of the U.S. Supreme Court to hear an appeal on the issues. By that time, Schmidt had become the first teacher in Chicago ever fired from his teaching job for copyright infringement, but the Chicago Board of Education had effectively admitted that the CASE tests were worthless by reducing their million dollar damages claim to zero. During the long and bitter court fight, CPS quietly abolished the CASE testing program in December 2002. By that time, the Board of Education had already voted (August 2000) to fire Schmidt from his teaching job in Chicago. Since then his name has been on what is locally called the “DO NOT HIRE” list, he said. However, rather than attempt to defend spending more than $1 million per year on the CASE tests in front of a jury, CPS reduced its claim of damages from $1.4 million to zero. This article originally appeared in the April 2008 print edition of Substance.